What Are the Cockroaches of the Sea? "Cockroaches of the sea" is an expression of unknown origin that traditionally refers to lobsters. The bottom-feeding crustaceans, generally the blue American lobsters, have long been a staple in the North American diet, possessing a nutritious and rich flavor without the extra calories. Lobsters weren't always the exquisite delicacy of five-star restaurants, though, and were once as common as cockroaches. Nowadays, "cockroaches of the sea" has come to represent a variety of creatures from the ocean. Cockroaches and lobsters belong to the same phylum: Arthropoda. Arthropods are invertebrates with exoskeletons, segmented bodies and jointed appendages. Most arthropods lay eggs and experience some form of metamorphosis. Phylum Arthropoda contains more species than all of the other phyla combined. Lobsters may look like cockroaches and crabs may look like spiders, but appearances are deceiving. In the late 19th century, lobsters began to turn their bad image around. Native Americans used to use these sea bugs as bait and fertilizer, as well as nourishment. In the 1600s, lobsters were an easy catch as they washed up on shore and became the obvious source of protein for the poor. As lobsters piled up, prices dropped and prisoners, servants and slaves begged for different fare. June 15 is national lobster day, proving how far the bug has come. Native Americans wrapped lobsters in seaweed and cooked them over hot coals. Now the crustacean is chopped into special sauces and smeared onto hot dog rolls for $12 a pop. Many words have become synonymous with the cockroach: pest, nuisance, invasive, dirty, rampant. Cockroaches are the plague of hot climates, appearing under beds, behind walls and in drains, and they are rarely a welcome sight. In the past, lobsters were defined as scavengers, like cockroaches, of garbage and dead animal remains. 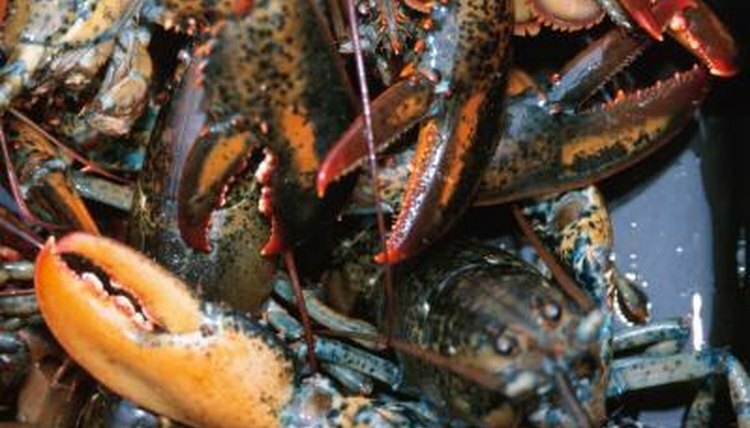 Lobsters live on the ocean floor, eating a variety of fresh seafood, including crabs, clams and mussels. Cockroaches and lobsters do share the cannibal gene when times are scarce. Shrimp, prawns, whales -- even jellyfish earn the title of sea cockroach when they respond to ecological change by accelerating the reproduction process. Japanese fisheries claimed that minke whales were cockroaches for the very reason that there were too many, justifying a need to hunt and profit. Prawns, shrimp and lobsters all resemble bugs crawling across the floor of their ocean home. Kathleen March has been a writer for 40 years. A professor and translator of Spanish, Portuguese, and Galician, she has studied several languages and uses them for travel and research. She enjoys medieval architecture and avant-garde poetry. Her work has appeared in numerous critical journals in the U.S. and Spain. What Is the Difference Between a Sand Flea & a Mole Crab? What Animals Have Copper-Based Blood? What Are Some Relatives of Horseshoe Crabs? Can Trilobite Beetles Be Pets?